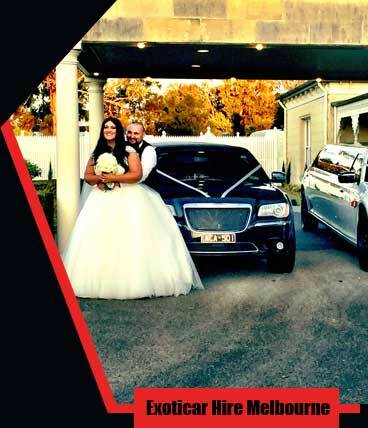 While providing high quality wedding car hire Melbourne service for many years, we at Exoticar saw a need for a more contemporary and Exotic style of wedding cars, general luxury car and chauffeured cars in Melbourne. Thus, Exoticar was born. Exoticar is not just a business, it’s a grand passion. Now into our Newest range of Range Rover Stretche and Limousines SUV’s and the latest Porsche Cayenne Stretch limousines along side with our Mercedes and New Chrysler collection. These cars are more exciting and luxurious than ever. Exoticar’s commitments to wedding limousine hire and chauffeured cars are second to none. We will provide you with all necessary paperwork upon the booking, thus giving you complete peace of mind. When you look for wedding limo hire, all of our drivers will assist you in making your special day truly memorable.. Contact Us today to find out more about Exoticar Hire and Chauffeured cars. Exoticar offers many services and the attention to detail offered to all our customers by our experienced staff, guarantees the best limo hire service Melbourne has to offer. Choosing the right wedding car can be a time consuming and stressful decision. Our experienced staff will make your decision an enjoyable one. Whether you are planning for a romantic date, an anniversary or a birthday party. Whatever the event, they all should begin in style. Exoticars are specialists in making your important event to be memorized. Our limousines are totally amazing and our customized, tailored services guarantee your special day goes precisely the way you desire it to. Are you looking for a Limousine Hire for your wedding day? Are you searching for an unbelievable experience to take you and eight of your companions to commend something extraordinary? Do you want to have a cleaned, dependable, proficient driver guiding you and your friends around for a night that you’ll always remember? All things considered, look no further because Exoticar has the ideal, extravagant range of limousines for you. The Exoticar is prepared to take you and your companions on the ride of your lives. Every one of you can appreciate the spacious comfort and extravagance. Turn on some music and appreciate the sound and additionally the limo lights while you’re going to and from your special event in such advanced style. With luxurious seats and a lot of space to sit easily, our wide range of limousines will be the ideal supplement to your special event. Exoticar will serve you the most luxurious and comfortable ride that you like to give us the opportunity to serve you again.